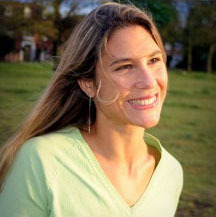 Based in South West London, Laura is a certified 500-hour Yoga teacher. She first came to yoga through curiosity but with a few doubts, as she had always liked sport and fitness, but she expected to be bored. She was lucky enough to have gone to a Rocket Yoga class. She loved it at once, moving with the breath was a revelation and an amazing experience, which she still enjoys each time she comes to her yoga mat, practising this active meditation. In 2012, she decided to go to India to complete a teacher training course in Ashtanga Vinyasa with The Yoga People. As she went more deeply into her practice, experimenting with different kinds of yoga, she found Yin Yoga, which was another revelation for her and the perfect complement to her dynamic practice. She completed a 300-hour Advanced Teacher Training Course in Rocket, Tripischore techniques, Mandala and Yin Yoga with The Yoga People. She has also been fortunate to be taught by different teachers such as Kino McGregor, David Swenson, Shiva Rae, Stewart Gilchrist, Naomi Absalom, Sri Dharma Mittra. Her philosophy is that everybody is capable of practising yoga, but not necessarily in the same way. First of all, everyone has their own expectations. Some people want an energetic style of yoga, like Ashtanga Vinyasa or Rocket, some people want a more relaxing style, like Yin Yoga or Restorative Yoga. Even though there needs to be some balance between these two different styles, she thinks it is important to adapt yoga to a person’s individual needs, bodies, injuries. All yoga is good for you, it just depends on what you’re looking for.